Because of Meeting You 因为遇见你 is this month's runaway hit nearly reaching the elusive 2.0. It ranked number 3 after its first and second day of broadcast but has climbed to the coveted number 1 spot from the third day onwards and stayed there since. Its closest competition alternates between Feather Flies to the Sky and The Battle at the Dawn but both lag behind without managing to break 1.0. I would have predicted as much because aside from Because of Meeting You, none of the other shows seem buzz-worthy enough. The Battle at the Dawn can bank on the popularity of Cecilia Liu but even she cannot bolster the lack of other big names and truth be told, the spy genre is not exactly the most mainstream. Granted ratings are never really an accurate measure of whether a show is good or bad but it's bad when there isn't enough interest to start a show in the first place. Case in point, I haven't bothered to watch any of the shows this month though I have to admit, I am very tempted to binge Because of Meeting You and all its melodramatic angst. 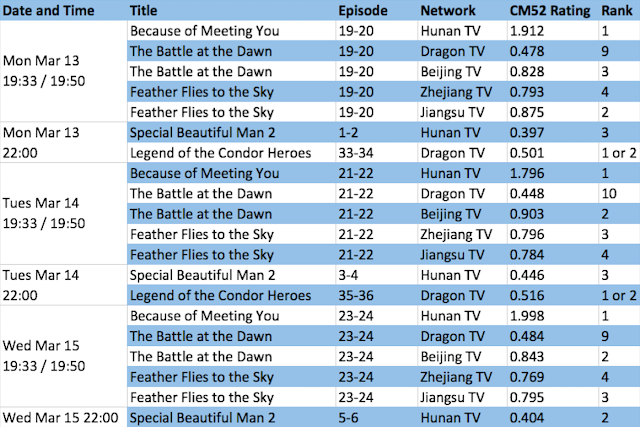 With Legend of the Condor Heroes still chugging along at the 10 p.m. slot, its ratings are ahead of A Different Kind of Pretty Man 2, Hunan TV's latest offering. It seems like a fair outcome given that Condor Heores is a classic while the latter is more of an experimental humor that is either gonna be a hit or miss. Because of Meeting You also leads in terms of online viewership but Ten Miles of Peach Blossoms deserves a special mention for taking second place. Seriously, I give it mad props considering that it's not even airing anymore! The Ten Miles cast is doing well too - Yang Mi tops the celeb list while Mark Chao and Dilraba Dilmurat follow closely at 4 and 5. If spy genre isn't mainstream then I'm guessing that The Disguiser's rating success was a rare thing? hi tia yes at least that's my opinion of it. My dad used to watch spy genre a lot and the cinematography was so underwhelming. The actors could act (like legit veterans) but they're not Hu Ge. In that sense, the trend's shifting with Zanilia Zhao, Li Yi Feng all headlining spy thrillers on their own but I still feel like it's not mainstream, unlike romance or costume dramas, which often has a mass appeal just for being one. Sparrow was a success as well, but that's likely due to Li Yifeng. I guess in the end actors' fanbase really do matter, especially male ones. @Anonymous: I think female fanbases matter more though. Most of the recent biggest hits are female centric dramas. Hi Anne J, thanks for this. 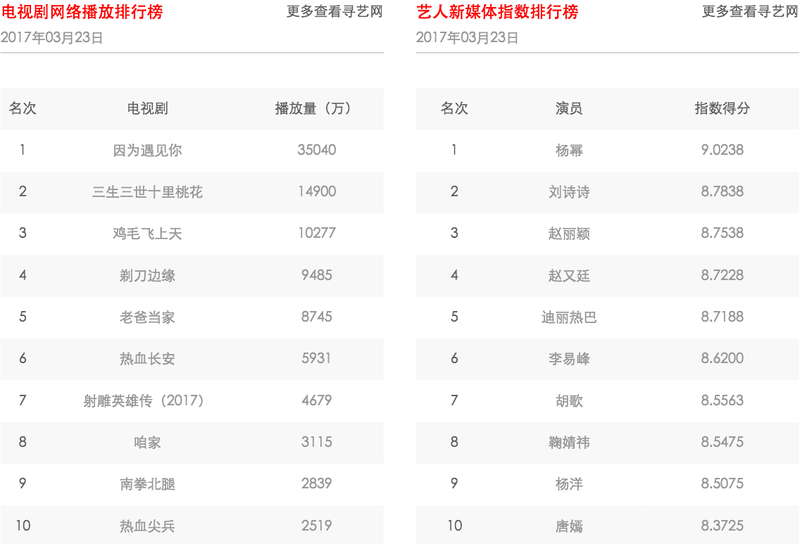 Do you happen to know what the total combined online views for Three Lives Peach blossoms are now? I don't follow c-ent so this type of ranking posts is always helpful. Thanks! Thank you for the ratings post! 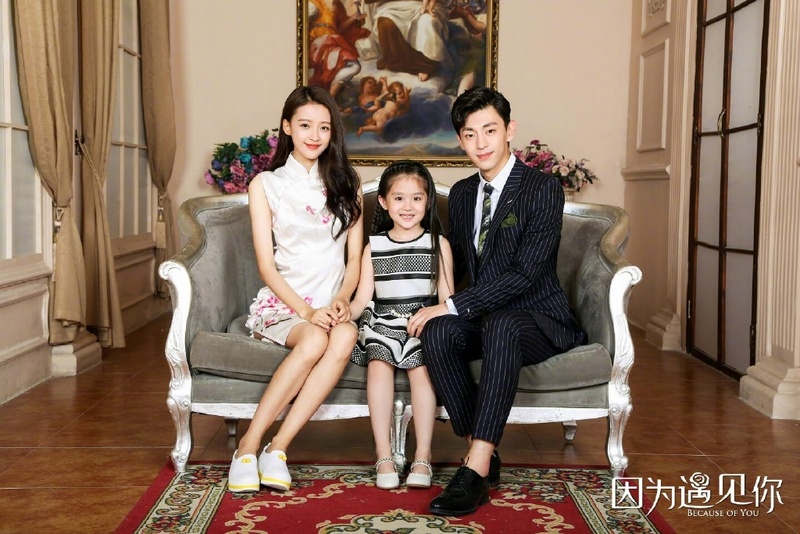 I'm happy for the cast to see "Because of Meeting You" doing so well particularly Sun Yi and Deng Lun. They are both doing a great job and I don't think I'd be able to make it through this drama without their sparkling chemistry and cuteness to counteract the maddening behaviour of so many of the characters. It's a shame for Cecilia Liu that the drama didn't do better. I've seen quite a few people complain that her recent roles are all the same but it looks like she tried something different with "Batte at the Dawn" but it didn't really work out. Does "Feathers Fly Across the Sky" have many famous faces considering it was neck and neck with "Battle at the Dawn" or is the genre more relatable to the audience? Hey Sunny, you're welcome:) I thought of you when I saw Because of Meeting You doing so well! And yes, it's too bad the gamble didn't pay off, sad thing is I remember reading about ppl complaining how Cecilia Liu had the same expression in every drama, including Battle at the Dawn. I never thought that about her since I always thought she was a pretty good actress? I'm happy for everyone who worked on Because Of Meeting You. Now I just need to catch up! It ends this week and I'm so behind. I thought Cecelia was a good actress but I have to admit the only drama of hers I've watched all the way through was BBJX so I'm not the best judge.